Tennessee's Colton Jumper (53) celebrates as he leaves the field after the Vols's victory over Florida. The Florida Gators visited the Tennessee Volunteers in a important SEC football contest at Neyland Stadium on September 24, 2016. Photo by Robin Rudd /Times Free Press. KNOXVILLE — Tennessee defensive coordinator Bob Shoop said he did not want to talk too much about 2016 when he met media representatives last week to preview the beginning of 2017 preseason practice. There was one thing gleaned from last year's 9-4 campaign that warranted repeating, however. "What we learned last year, the lesson I learned personally, is that you can never have enough guys," Shoop said. Injuries at linebacker and defensive tackle forced him to reach deep into the depth chart as Tennessee's defense struggled late in SEC play. The 2016 experience is providing the Volunteers' second-year coordinator a heightened urgency to develop depth, especially at linebacker, as he begins preseason camp with talented middle linebackers Darrin Kirkland Jr. and Daniel Bituli limited by injury. 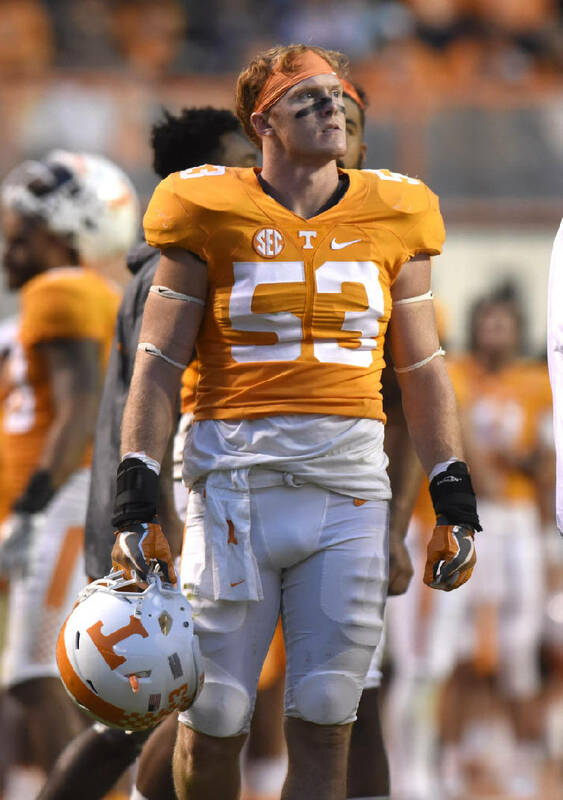 Colton Jumper (53) plays linebacker for Tennessee. The Tennessee Tech Golden Eagles visited the Tennessee Volunteers in NCAA football action at Neyland Stadium in Knoxville on November 5, 2016. Colton Jumper (53) and Cortez McDowell (20) get ready on the defense. The University of Tennessee Orange/White Spring Football Game was held at Neyland Stadium in Knoxville on April 16, 2016. "In this league, it's such a physical league," Shoop said. "There's so much attrition, and games 12 and 13 are obviously as important as games one and two." That reality is one reason why Shoop is happy to have Baylor School graduate Colton Jumper back this season. Jumper filled in when Kirkland injured his ankle last season, and the Lookout Mountain resident was the Vols' fourth-leading tackler. Kirkland is the expected starter at middle linebacker and Shoop is frequently asked about Bituli, a sophomore and former four-star prospect. But Shoop made it clear Sunday after the second practice of the preseason that Jumper is viewed as a first-team caliber player, even as outside hype builds around younger players who entered with higher accolades from recruiting services. "I said it all last year, Colton Jumper, we look at him as a one," Shoop said. "He's played a lot of big football for us. He was the leader and a guy who played when we won big games here both at home and on the road. He's got a great command of the defense. He's vocal; he's physical; he's got himself in great shape. It's been a great opportunity for him." The former two-star prospect once was buried on the depth chart and a target of fan vitriol on social media. Now Jumper is a battle-tested veteran Shoop described as confident and vocal. "He has a great command for the entirety of the defense, not just what he does but what everybody else does," Shoop said. "He can solve and fix problems on the field like you would hope a middle linebacker or safety would be able to do." A fourth middle linebacker, freshman Will Ignont, is player who has "flashed" early in camp. The Huntsville, Ala., resident broke up a pass in practice Sunday and recovered a fumble Saturday, according to Shoop. "He's always around the ball," Shoop said. The outside or "Will" linebacker competition includes senior Cortez McDowell, redshirt sophomore Quart'e Sapp, who is back after missing nearly all of 2016 with injury and Austin Smith, who spent last year at defensive end. 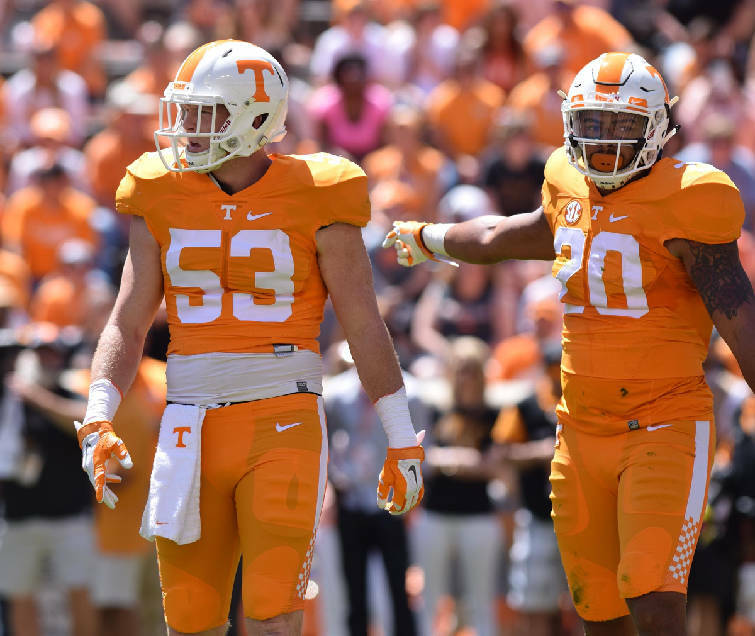 "Everyone recognized that we lost Kirkland and (Jalen Reeves-Maybin) last year, but what people fail to realize, possibly, is that we lost Sapp and Austin Smith," Shoop said. "They didn't play at all once SEC play rolled around." Seniors Elliott Berry and Dillon Bates add additional depth and experience to the linebacker corps. And no one should forget about true freshmen Solon Page and Shanon Reid. If it sounds like a lot of linebackers, it's worth remembering what Shoop learned last year. "You just never know," he said. Contact David Cobb at dcobb@timesfreepress.com.